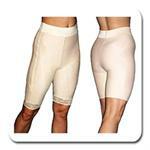 Compression garments are specially designed elastic apparel worn after surgical procedures. 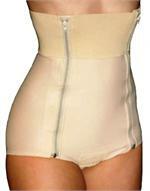 They also may be used as body slimmers and provide additional support by contouring to the body or body part. Compression garments have several medical benefits such as reducing swelling from a surgical procedure and decreasing the risk of a blood clot. By speeding up blood flow, compression garments assist in flushing harmful fluids out of the body during post-surgical recovery. They also help control sudden uncomfortable movements (i.e. cough or sneeze), which is especially important during the immediate post-operative stage. Compression garments provide patient comfort and accelerate the healing process. When is a compression garment used? Compression garments have several uses but are intended to be used during surgical recovery. Plastic surgeons generally recommend the use of compression garments after a tummy tuck (abdominoplasty), liposuction, arm lift (brachioplasty), facelift (rhytidectomy), gastric bypass, gynecomastia treatment (male breast reduction), and breast surgeries. Dermatologists can also recommend compression garments for patients with lymphoma, burns, and varicose veins in an effort to increase quality of life. A popular trend with compression garments is non-medical use for body shaping and slimming, which helps clothing fit better. What is the difference between regular or retail garments (a.k.a. sportswear) and medical compression garments? There are vast differences between retail garments and medical garments. For example, medical wear has a much higher level of compression than garments sold through retail establishments. Medical-grade garments feature additional fabric layers, panels, and a higher Lyrca®/Nylon (or Powernet) content. A medical garment's compression rating can be 3-4 times that of sportswear. Medical garments also are much more durable than retail compression wear. As long as product care instructions are followed, medical compression garments are designed to be worn 24/7 for up to 6 to 8 weeks without losing integrity. Retail sportswear is only designed to be worn for the short term (4-6 hour increments) and would rapidly lose integrity if worn all day everyday. What are the different types of compression garments? Important points to remember when choosing a post operative compression garment is selecting the applicable garment and getting the right size. Choosing the incorrect post surgical compression garment can do more harm than good. Always seek your surgeon or patient recovery specialist advice when making this decision. Safe, supportive comfort for the abdomen and groin. The men’s abdominal supporter features five flexible cotton/nylon panels for precise body contouring, adjustable hook-and-eye closures, and our softest fabric weave to ensure complete comfort. Perhaps the most luxuriously comfortable bra you will ever own. Features include velvety-soft shoulder straps and convenient front hook-and-eye closure. Prized for its unique ability to contour and shape breasts with exceptional smoothness and support. Fabulous flexibility and versatility. Nouvelle’s compression sleeves can be worn along with your own bra while providing healing support for the arms. Convenient, easy-to-use Velcro back closure. Available in beige and black. Richly-detailed with convenient front hook-and-eye closure, our newly-designed compression sleeves provide superior healing support for patients recovering from varied arm procedures, including brachioplasty and liposuction. Available in beige or black.